Montoya Detention Tee Design Review. The Montoya Detention tee design is a The Princess Bride tee for the fans of The Simpsons chalkboard gag. As for the concept, the Montoya Detention tee design is a mash up that plays on both Bart Simpson's detention punishment of writing on the chalkboard and Iñigo Montoya's little introduction/taunt that he's been practicing for years. "Hello. My name is Iñigo Montoya. You killed my father. Prepare to die." The repetition theme is a common element in both. 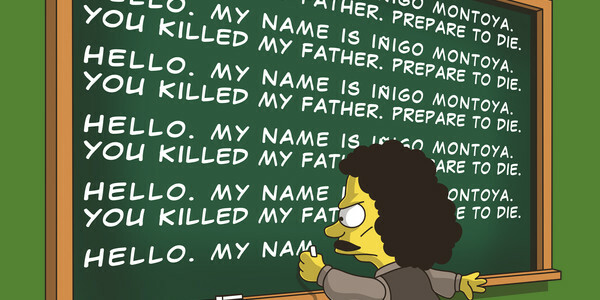 This is done in The Simpsons drawing style and depicts Iñigo as the one writing on the chalkboard. The clothing is all Iñigo. But the face is a good blend of both Bart and Iñigo. The coloring is great and better than most of the other Simpson's parodies out there by far, as is the shading. The details that are added here like the chalkboard being a darker green around the edges than in the center. Even the character's own shadow matches his shape and is not just a circle or spot on the floor. 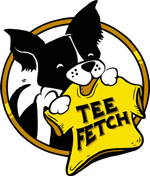 Fans of either franchise could go for this shirt. But The Princess Bride fans would definitely be the main target here due to the quote. Montoya Detention Tee Design by Saqman.